Is there a better alternative to Audio Companion? Is Audio Companion really the best app in Audio category? Will Audio Companion work good on macOS 10.13.4? Audio Companion needs a rating. Be the first to rate this app and get the discussion started! It will either act as a normal audio recorder or as a recorder that automatically split each song into separate files. The files may be saved as ordinary AIFF files (ready for burning an Audio CD) or saved as MP3 files or any file format that QuickTime can create. 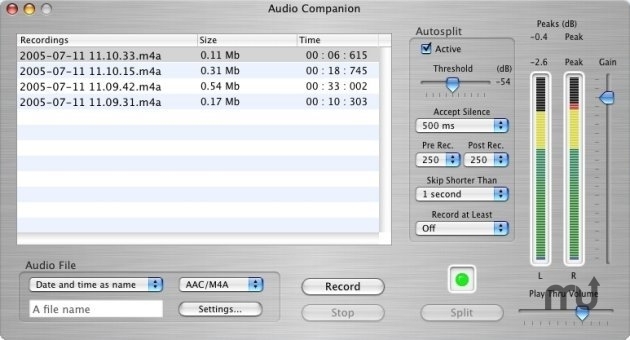 To use Audio Companion to record audio coming from other applications, please check out the free Soundflower utility.